There’s nothing worse than stepping on a LEGO on your way to the bathroom at 3 a.m. That’s why you should download LEGO City Spotlight Robbery – our Free App of the Day will save your tootsies from imminent danger. In a daring midnight raid, the burglars are breaking into the LEGO® City museum! Use the helicopter searchlight to guide the Elite Policeman through the dark to catch them. Explore the different rooms within the museum and find useful objects to help. Find and collect useful objects to help the Elite Police. Find and collect spanners to repair damaged power supplies. Find and collect keys to unlock doors. Use ladders to move between floors. 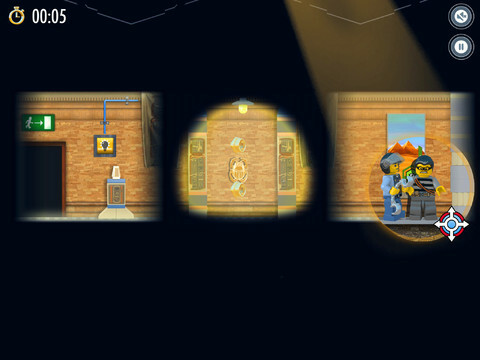 Use the searchlight to find crooks hidden in artworks, statues and artifacts. Shine the light on the blue diamond to start a disco party to distract the burglars and reveal their location. Use your finger to drag the searchlight, reveal a path and guide the Elite Policeman to the burglars. Tap the spinning gold studs to claim a time bonus. Tap the switches to activate them. Switches can turn on lights which make it easier for the Elite Policeman to progress through the building. Tap Computers to deactivate laser beams. You will need to find 3 computers in order to turn off the lasers. Tap ladders to lower them. Tap special objects to move them. Moving objects could help you reach broken ladders, reveal hidden items or even confuse a hidden crook.